Lighting can be a major consumer of electricity in an off-grid home. We've replaced many of our incandescent lamps with home-built LED replacement lamps to keep our night time energy use as efficient as possible. When Patrick first told me that he was going to make his own light bulbs, I had a hard time believing him! Now, our trailer is primarily lit by custom LED light bulbs made right in our own workshop. Since the first bulb, there has been many revisions and improvements to the design. Our brightest most efficient bulbs consist of 15 white LED lights, a voltage regulator, a resister and a diode wired to a circuit board. In an off-the-grid solar powered system, energy awareness is critical. It is best to know how much energy every appliance draws and it even pays to examine your lighting. One 25 watt incandescent requires 10 times the energy that is needed to power an LED light bulb! To conserve energy we use LED lights for all general lighting inside. We do have some incandescent bulbs installed for occasional use. In addition to LED lights, we also use Fluorescent lights. They also require much less power than incandescent bulbs. 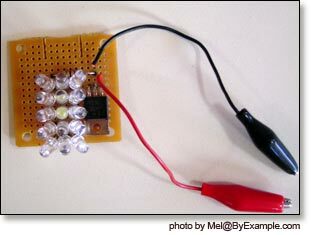 The good news is, you don't have to make your own light bulbs to save on power. There are many commercially available solutions. LED bulbs for trailers are generally available at RV supply stores. While they costs more, aren't as bright, and have a shorter life span than our custom bulbs, they work fairly well, though they need to replacement often. There are also LED desk lamps, head lamps, and flashlights on the market. Compact Fluorescent bulbs offer energy savings and are designed to work in place of standard incandescent bulbs. Using compact Fluorescents in place of incandescent bulbs in your home is an easy way to immediately reduce your energy expenditures.